Christmas season is the season of engagements, weddings, baptisms, house-warming ceremonies and other such family festivities amongst Keralites (people from Kerala). Since it is an auspicious season and the weather is cool, the entire month is always packed with many family functions…. That means loads of shopping, travel, food and stress. It is again that time of the year when you find me running about crazy trying to manage more than I should be doing. Needless to say, the best part about this crazy time of the year is the food…. You can eat and keep eating all sorts of sweets, fatty, unhealthy, greasy food and blame it on Christmas, or Santa for bringing in this sweet-treat tradition! I have been in Kerala for the past 15 days, and have not been able to take pictures of what I am cooking, stuck in the middle of constant flow of relatives and guests. Christmas day was the usual traditional food-fare with all sorts of non-vegetarian preparation laid out. For me, the best part of the day is the breakfast, I love the traditional appam and egg curry that is made in almost every Malayali Christian household. I have fond memories of 25th morning breakfasts at home… we would go to church early in the morning; come back starving and mom would dish out hot appams with mutton stew or egg curry…. Yummm and it was Merry Christmas!! Appams are made of primarily rice flour. 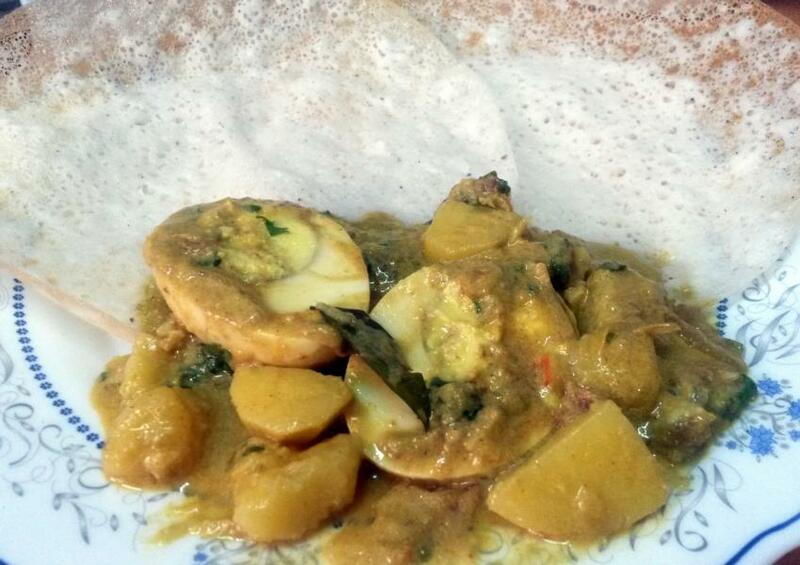 Different kinds of appams can be made using the same mix. Although it is a lengthy process, the end result is a healthy pancake and totally worth it. Rice is soaked overnight, or atleast 6-7 hours. Drain the water and keep aside. After the rice is soaked the quantity doubles up and so when you put in the blender for grinding you may get around 2 – 2 ½cups rice. Accordingly, the measurements of the other ingredients is for the double quantity of rice. Blend all these ingredients together using little water. The mixture should not be thin. It should be of medium consistency. Grind the mix to a coarse mix. Transfer to a big bowl and keep it covered overnight for fermenting. If you want to prepare the appams the next day morning, then soak the rice the previous day morning and grind the mix the same night and keep for fermenting overnight. 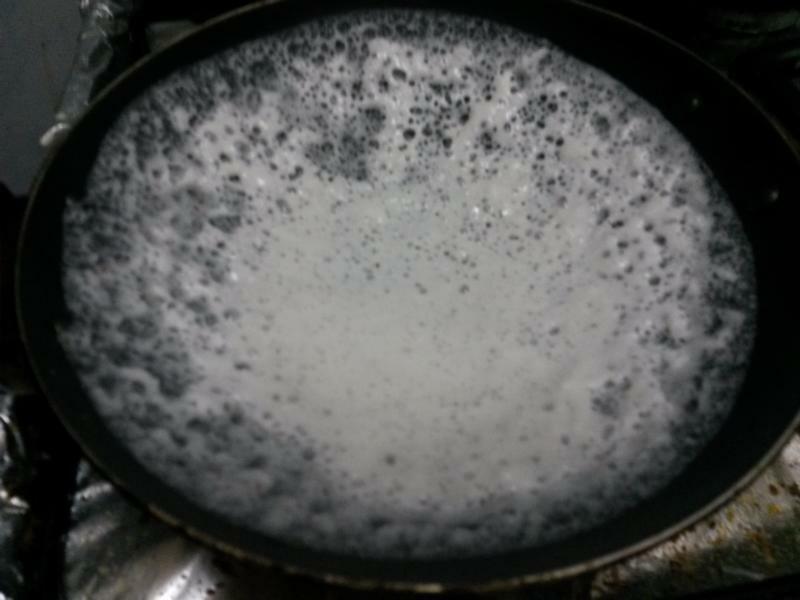 Once the mixture has fermented, heat an appam-chatti (aluminum vessel especially used for making appams). I use the non stick one. Pour one ladle of the ground mix and you can hear the sizzling sound, quickly swirl the pan in a clockwise direction. You have to be quick doing this, as the mixture cooks quickly in the hot pan. You will get it with a few trials. It should be a bit dense in the centre and transparent thin on the sides. Cook on medium flame covered for around 2 minutes and check whether the sides of the appam have turned light golden brown. Appam is ready to be served. Serve hot with egg curry or stew. 1 tsp active dried yeast – dissolved in around 3-4 tblsp lukewarm water. (If using instant yeast, then 1-½tsp, can be directly added to the ground mix without dissolving it earlier in water). Soak the raw rice overnight or atleast for 6- 7 hours. Drain the water and keep aside. After the rice is soaked the quantity doubles up and so when you put in the blender for grinding you may get around 2 – 2 ½cups rice. (So the measurements of the grated coconut, cooked rice and yeast is for the double quantity of rice). 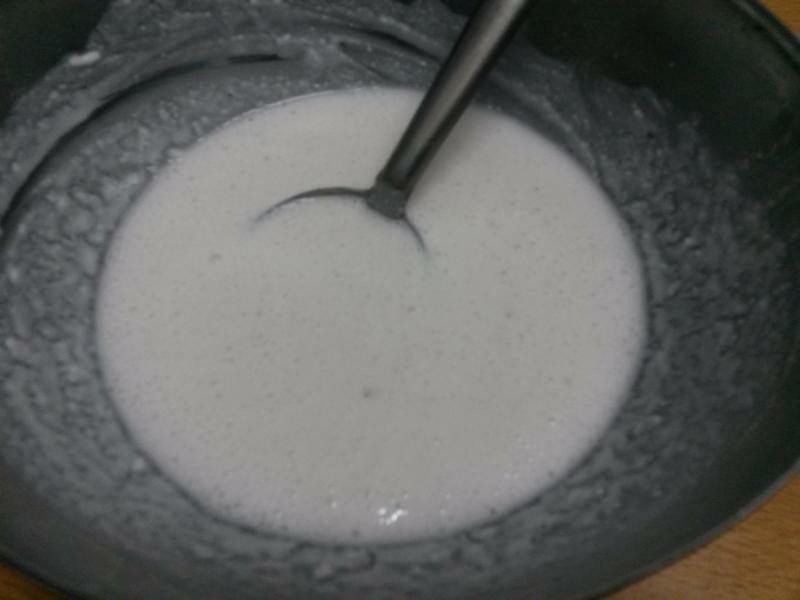 Once the mixture has fermented, heat an appamchatti. Pour one ladle of the batter and you can hear the sizzling sound, quickly swirl the pan in a clockwise direction. 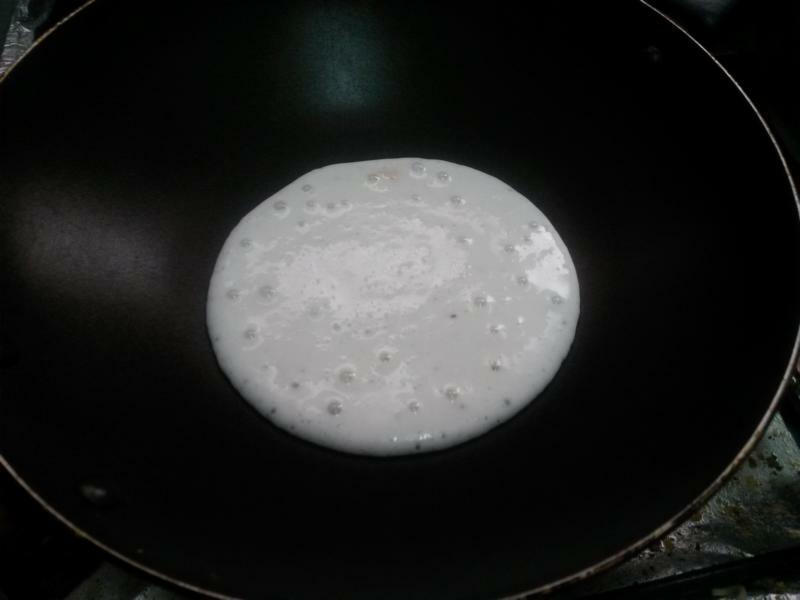 Cook on medium flame covered for around 2 minutes and check whether the sides of the appam have turned light golden brown. Appam is ready to be served. Serve hot with egg curry or vegetable stew. Note – If you don’t have time to soak rice overnight, you can use ready-made rice flour; mix it with instant yeast, sugar and water till you get a thick consistency and leave it to ferment for maximum 4 hours.